Hi there, my name is Kim and i am 19yo. I snapped my achilles tendon last saturday playing netball and had emergency surgery on it on sunday. Like someone else’s blog i read, mine too recoiled into the calf muscle. I am in a plaster cast for 8 weeks and then one of those snow boots for another 8 weeks…im shocking on crutches and so the next few months of my life shall be spent right here on the couch, stuck between the tv and my laptop. I only just recently discovered that i am really young to do this! just curious as to if there is anyone else my age who has done the same injury??? im no stranger to reconstructive surgery as i have also had 3 knee reconstructions on my right knee too…thankfully the achilles i snapped is my left one, but trust me, tearing the achilles is so so much worse than the ACL in your knee. I suppose my reason for writing this blog is to relate to people who have had the same thing…so please comment on my blog and help me out during this somewhat difficult time. Gidday Kim, from Northern Beaches in Sydney! If you’re good about staying in bed with your leg elevated and your wound heals faster you might not need to be in cast for 8wks. At 2wks PostOp I went to fiberglass cast which was so much lighter. I’m at 4wks now and in boot. My original estimate was 8wks in cast. You’ll get the hang of crutches, the first couple of weeks are always the worst. I’m 24 and snapped my achilles while sprinting then i re-ruptured at 5 weeks post-op while tripping and landing on my bad foot. Just take it easy and you’ll heal up quickly. I got over confident with the amount of time I spent outside of the boot in physical therapy and it came back to bite me. I snapped (completely ruptured) my right achilles when I was 21 (ironically playing Netball too). Then snapped (another complete rupture) my left achilles when I was 26 (playng tennis!). Both operated on. I can go to the gym and do sport again now. I think it is more psychological that physical the fact that I do not compete as competitively as I used too. Although that spring has definately gone. Do I give up doing sports I love, with great friends and social elements? In my case no, but I’m just taking bets on which one will re-rupture first! Who said sport is good for your health? Julie - I feel so sorry for you. You must have endured a terrible 6 months waiting for someone to get their act together and put you on the right road to recovery. There are a few people here that have endured long waits before getting the fix, not many though, so you are in a very special club. You will probably feel fairly helpless for the first few weeks but it does get better. You are doing things right so far, pain meds, rest and elevation. I really hope your recovery goes well. A good blog for you to read is Ali39 and Polly’s last post. I did mine last week, trying to move a box with my wheelchair and got my foot caught. I heard it snap, and then the PAIN. You hear of sports people doing this and here am I, I don’t even walk!. I am not paralysed thou so feel the pain and transferring from my wheelchair is a mission. I have brittle bones (osteo-genesis imperfecta) and cerebral Palsy but never done this, just breaks, which I can assure you are less painful (well most) My mum had a heart attack two days before over here for Christmas so we were both in the same hospital for the night. They may operate as it is very hard for me with plaster and to keep the foot in the right position. No swimming for a few weeks! Di, we’ve had Achilles rupture (ATR) folks here before who were in wheelchairs, but mostly AFTER the injury, especially if they ruptured both ATs at once. You may be the first who started in a wheelchair. “Welcome” — though I’m sure you’d rather not be here. Good luck to you and your mum, too. With or without surgery, it’s quite important to keep the foot in the right position, specifically the flex angle of the ankle (which is what pulls on the healing AT). A well-fit boot or cast should do that, whether or not you’re in a wheelchair. It’s logical that a surgically repaired ATR could stand a little more abuse during the first few weeks than a non-op one, but immobilization and protection are still very important parts of ATR rehab, either way. Most good protocols have you NWB (non-weight-bearing) for the first 2 weeks, then moving to Partial WB (PWB). FullWB can come as early as 4 weeks after either, surgery or full non-op immobilization of the ankle. Of course, these things are different for a patient that isn’t returning to walking! Your WB will mostly be shifting in and out of the chair, I’d guess. Do you stand in deep water when you swim? A number of us have found immersion in flat water (mostly pools) very useful during rehab, because we can adjust our “weight” so we can do exercises that are impossible on dry land. That may be a way for you to do a bit of WB, without “scaring” your healing AT or the rest of your body/bones. BTW, a member of my sailing club (small boats) has brittle bones, and has broken a couple of them while sailing. 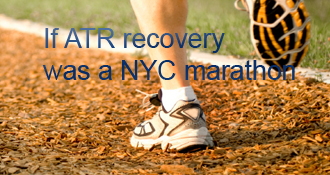 For a while we shared an Orthopedic Surgeon — the one who surgically repaired my first ATR! If you can, follow the steps on the Main Page to set up your own blog, so you can have your story and your questions (and answers, with luck!) all in one place. Get that checked out, doesn’t sound right to me. Cannot imagine why they would do that. Toenails came off? Were they loose before? Any tingling in feet or bad circulation? I’d probably check with GP just in case, haven’t had that happen. Snapped Achilles Tendon is proudly powered by WordPress and WPDesigner..